BMW, Honda, Nissan and Toyota. Furthermore, retiree benefits must be reduced so that the total burden per auto for domestic makers is not higher than that of foreign producers. ….Second, management as is must go. ….Investments must be made for the future. No more focus on quarterly earnings or the kind of short-term stock appreciation that means quick riches for executives with options. Manage with an eye on cash flow, balance sheets and long-term appreciation. ….Don’t ask Washington to give shareholders and bondholders a free pass — they bet on management and they lost….A managed bankruptcy may be the only path to the fundamental restructuring the industry needs….The federal government should provide guarantees for post-bankruptcy financing and assure car buyers that their warranties are not at risk. So what happened? Taking Romney’s points in order: First, Obama rejected the automakers’ original bailout requests as too charitable and sent them back to the table. Second, his auto task force forced the UAW to accept reductions in both worker compensation and retiree health care. Third, they fired GM CEO Rick Wagoner and handed management of Chrysler to Fiat. Fourth, they fundamentally restructured GM’s finances, killed off a bunch of brands, and shut down a thousand dealerships. Fifth, they put both companies through a prepackaged brankruptcy that wiped out shareholders, forced bondholders to take a substantial haircut, and provided guarantees for post-bankruptcy financing. Sixth, Obama put a government guarantee behind GM and Chrysler warranties. None of this is precisely what Romney called for. He criticized Obama’s plan for not being done earlier. He undoubtedly would have preferred more concessions from the UAW. He wanted the government’s stake in GM to be immediately distributed to taxpayers instead of being held for later sale. He said the Detroit bailout had “not been well-played” by either Bush or Obama. Still, his op-ed really isn’t all that far off from what eventually happened. As for the two gotcha quotes currently being distributed around the intertubes, “Let Detroit Go Bankrupt” was the headline the Times put on Romney’s op-ed, not something he wrote himself. His piece makes it clear that he favors a managed bankruptcy, which is what eventually happened. And Romney didn’t say that Obama’s plans for rescuing the auto industry were “tragic” and “a very sad circumstance for this country.” He said, “This is a very sad circumstance for this country, and it represents bad decisions by management, overreaching by the UAW. It’s really tragic in a lot of ways.” He was obviously referring to Detroit’s troubles in general here, not specifically talking about Obama’s plan. 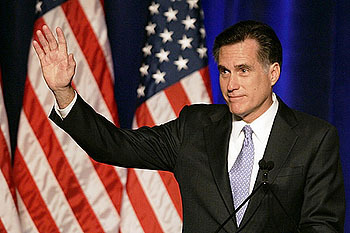 Is Romney trying to take more credit than he deserves here? Sure. But it strikes me as being garden variety political puffery, not third-degree hypocrisy. Unless someone can turn up some other quotes, that is. UPDATE: Hmmm. On April 29, 2009, after the outlines of the Obama plan were fairly clear and GM produced a proposal meant to address its requirements, Romney trashed it in pretty strong terms. “What is proposed is even worse than bankruptcy,” he said. “It would make GM the living dead.” And a correspondent says that Romney consistently opposed the infusion of any government money into the bankruptcy process, which is pretty far afield from the “course of action that eventually the Obama administration adopted.” If this is true, it makes the flip-flopping case stronger. Still not a killer case, maybe, but a little stronger.